Staff photo by Emmy Errante. The University of North Carolina Wilmington men's soccer team runs drills Thursday, Sept. 24 at the team's practice fields. With a national ranking and a win over an in-state rival already this season, the University of North Carolina Wilmington’s men’s soccer team is poised to build on its successful 2014 season that ended with the Seahawks’ first ever NCAA tournament win. If UNCW is to advance farther in the NCAAs this season, it will do so with a crew of new freshmen players who are guided by some core senior leaders. 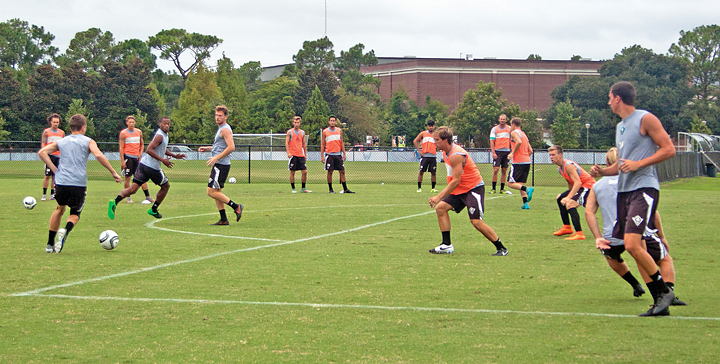 Head coach Aidan Heaney brought on nine freshmen to help continue last season’s momentum. Several of them played together previously in the Capital Area Railhawks Academy in Raleigh, so they bring a new style to the Seahawks’ game. The Seahawks, currently ranked No. 24 in the NCAA men’s soccer poll, are 6-1-1 midway through the season, despite graduating key members of last year’s squad like Colonial Athletic Association defensive player-of-the-year Jacob VanCompernolle. To help guide the young team, the Seahawks’ seniors have stepped into leadership roles. Michael Mecham filled the spot vacated by VanCompernolle as team captain and center defense. He said he learned a lot from playing alongside VanCompernolle the past three years, but he wants to bring his own style to captaining the team. “I lead in a different way and I play in a different way, so maybe I fill that roll but in a different way,” Mecham said. He plays on UNCW’s back line alongside freshman Matt Morgan and that partnership has been a valuable element to the defense, Heaney said. Seniors also drive the Seahawks’ attack. Colin Bonner leads the CAA in both goals and assists. Nathaniel Goodwin, whom Heaney said has struggled with injuries in the past, is making an impact now that he has healed. Escobar has also rebounded after dealing with adversity. He sat out his freshman season and didn’t play his sophomore season due to an ACL tear. Last season, he saw action in 19 games but didn’t score until he netted the insurance goal in the team’s 2-0 win during the NCAA tournament first round. This season, he already has scored two game-winning goals, including the opening tally in the team’s 3-0 victory over Duke University at Koskinen Stadium. Mecham said the team’s mentality this season is to approach every game the same and not underestimate or overestimate an opponent, regardless of its reputation. “Duke is this big-name ACC school with all the fancy stadium and fancy gear, but we always felt like we were the better team every time we’ve played them,” he said, adding that the Seahawks have bested the Blue Devils all four years he has been on the team. The team will remember that mindset Oct. 6 when they come up against the University of North Carolina Tarheels, a squad currently ranked second in the country. Heaney said his team is excited to play the non-conference match, but they’re equally focused on earning wins in their challenging CAA conference. Another NCAA appearance is the ultimate goal, Mecham said, but they don’t simply want to repeat last year’s success.